Each new episode seems to raise the stakes of this action adventure series. In the seventh installment, Bobby Pendragon realizes that the Quillan Territory can be saved only by defeating game masters Veego and LaBerge in a fateful competition: Winning the Quillan Games could bring him a giant step closer to understanding the meaning of being a Traveler. Losing brings instant extinction. I started reading this series forever ago. Not even kidding. Remember those little leaflets of Scholastic books that you used to get in elementary school, which would prompt you to beg your parents for pocket money so you could order one? I’m pretty sure I bought the first 4 books out of one of those. Then stuff happened. Mostly, I bought other books instead. I read the next two from the library and then just didn’t read the rest (I think this had something to do with the fact that I was reading them as they came out and by the time the next one came out, I was thinking about other books). Anyways, I saw this, and the next one, in the library the other day like a blast from the past and I decided to pick them up. It took me a while to finish, mostly because I’m not as invested in the series as I once was, but I am now prepared to (finally) review it! 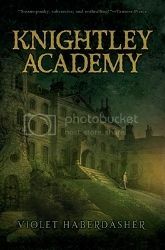 This book, more than anything else, reminds me of The Hunger Games, though of course it was published many years earlier. Now before you rush out to buy it on that statement alone, let me remind you that this is the 7th book in a fairly long series, and you will probably be extremely lost if you start there (and the rest aren’t even remotely Hunger Games ish. Sorry). 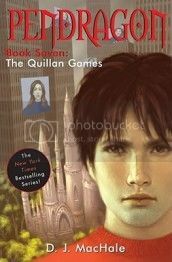 The premise of the world (called “territory” in this series) Quillan is a world much like ours that has been taken over by a single company. This company controls everything, from what foods you eat to what television you watch. Similar to the Hunger Games, the main form of entertainment is the “games,” most of which are deadly, and all of which are televised (on big screens in the street too, you can’t possibly miss it). The people have forgotten their rich heritage and forgotten how to think. Our hero, Bobby Pendragon, is swept into the games and forced to fight for his life only minutes after arriving in the territory, without a clue what is going on. It is interesting, to me, to pick up a series that you never finished as a kid. I can see why I loved it – it is very original and I still love that. There are so many different territories that it seems like MacHale gets to world build constantly, but that doesn’t detract from the action. He somehow has figured out how to build his worlds in a way that is quick but gives a full sense of where you are. Then, of course, there are the sections about Bobby’s two friends Courtney and Mark, who still live in our world (Second Earth in the series). They are his acolytes, and we see Bobby’s entire story through their eyes – he magically sends them journals that they have to read and keep safe for him… I forget why, it’s very early on in the series, and hasn’t been that important yet. But the thing that made this book stand out from the rest of the series, for me, is how twisty it has become. I don’t remember how long Bobby has been traveling on his own, but he is now making decisions for himself, trying to figure out who to trust. He makes some definite mistakes in this one. We don’t find out until the very end, but someone Bobby trusts basically screws him over. This is the novel, much like Book 4 of Harry Potter, that marks a turning point in the series. Bobby is becoming an adult. It’s a really important part of the series, and I like how MacHale deals with it. It happens so fast that when Courtney sees him at the end, she doesn’t recognize him. Bottom line: If you liked Hunger Games and Harry Potter, this series is definitely for you. It’ll be a little weird at first, but give it a chance and I can almost guarantee it’ll grow on you. This series is 10 books long and was finished in 2009. The first novel is The Merchant of Death and can be found in both novel and graphic novel formats.